When New York City developers buy warehouses and other industrial buildings that are zoned for residential use, the first thing they’ll generally do – unless they’re landmarked or need some sort of city permission – is tear them down. While YIMBY understands the financial exigencies that prevent them from doing costly restorative work, it still brings a tear to our eye to see a handsome old brick structure come down. Which is why we’re looking forward to construction starting at 79 Quay Street, a project one block inland from the Greenpoint waterfront. 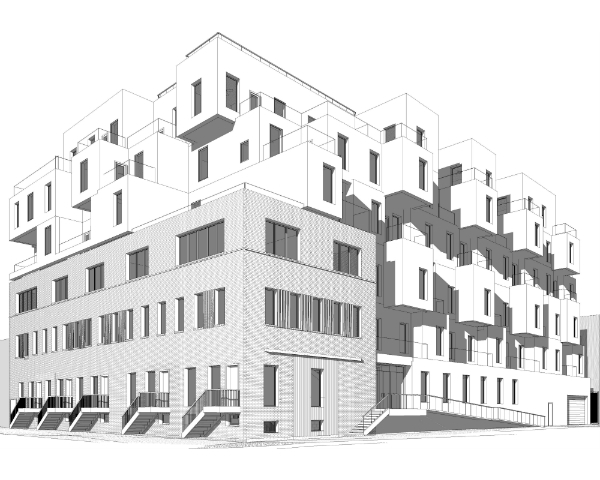 There, just north of the Bushwick Inlet (which forms, confusingly, the boundary between Greenpoint and Williamsburg), Cayuga Capital Management is planning a 60,000-square foot residential building, with a mix of duplex studios through three-bedrooms. The rendering Cayuga shared with YIMBY depicts townhouses forged out of the existing brick building on the corner of Quay and West Streets. A new rental apartment block will rise from behind it, standing six stories tall, and characterized by a proliferating cube design. In keeping with New York’s iterative nature, the future addition appears to be the third version of the initial structure, which was acquired for $3.8 million. The brick on the third story of the existing warehouse doesn’t quite match the bottom two floors, and the windows are also a different style. Construction will likely start in spring 2015, and Tony Daniels’s Gowanus-based Cycle Cities will be responsible for design. They’re also teaming up for Cayuga Capital’s 100,000-square foot office-and-retail project at 87 Wythe Avenue, revealed on Monday in the Wall Street Journal, which will exhibit a similar motif.